Black Uhuru, Bob Dylan, The Mighty Diamonds, THE GLADIATORS, Althea And Donna and more. 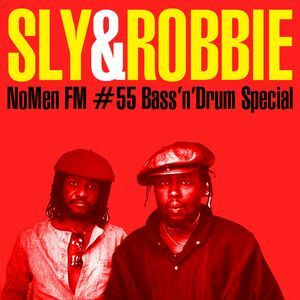 The unbeatable drum and bass partnership of Sly Dunbar and Robbie Shakespeare has been an unsurpassed institution in Jamaican popular music for over 35 years. Sly and Robbie are estimated to have played on or produced 200,000 recordings, many of them on their own Taxi label. They teamed up in the seventies as both shared the same ideas about music - both were huge fans of Motown, Stax, the Philly Sound and country music as well as the Jamaican labels Studio One and Treasure Isle, and reggae production in particular.The duo changed the face of reggae several times: in 1976, they introduced a harder beat called "Rockers" then introduced the "Rub A Dub" sound in the early 1980s. Sly and Robbie were important in developing the trend towards computer-assisted music and programming in the mid 1980s. Chris Blackwell made them the core of the Compass Point All Stars, the Nassau (Bahamas) recording band who made classic records with Grace Jones, Bob Dylan and countless others. Turn up the bass! From yard and abroad, big-big chunes, thanks NoMen!